Service Learning is recognized internationally as a highly valuable learning format for educating citizens for today’s increasingly complex and diverse societies with a growing range of needs among its members. Employers in a wide range of sectors especially welcome possible employees who have completed a service learning project since it underscores a candidate’s skills in engaging complex societal issues needing integrated knowledge and advanced service skills. Service Learning makes moreover a perfect fit with the American Studies Leipzig effort to integrate throughout its curriculum the virtues of Humboldt and Dewey philosophies for higher education. 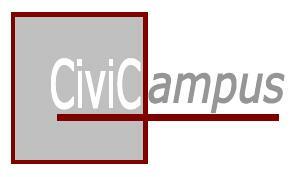 Initiated in 2009, CiviCampus is a forward-looking project at ASL that seeks to implement models of civic engagement, employability, and innovative forms of learning into the curriculum American Studies and on the university level. Those active in the project have been negotiating with supporters inside and outside the university in order to promote Service Learning. In July 2010, CiviCampus was awarded financial support by the Vereinigung von Förderern und Freunden der Universität Leipzig e.V. to conduct a Service Learning pilot project at ASL. If you have any questions about CiviCampus or want to get involved, please write an E-mail to: aslservicelearning@uni-leipzig.de.